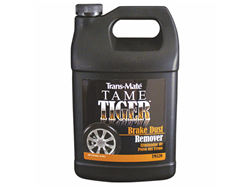 Formulated with thioglycolate that chemically reacts with iron in brake dust and rail dust. Contains no caustic, acid or bifluoride. Safe for all wheels. Ready to use. Spray onto surface and let sit several minutes. The product will turn red as it reacts with brake dust/rail dust iron. For heavy buildups use a brush, sponge or mitt. Rinse thoroughly using high pressure water. Recommend wearing Nitrile gloves when applying product to wheels as the smell is very unpleasant and stays on the hands for hours.